wanted a large terrace for dining with friends, a more casual space for enjoying coffee in the morning sun, and herbs for cooking. 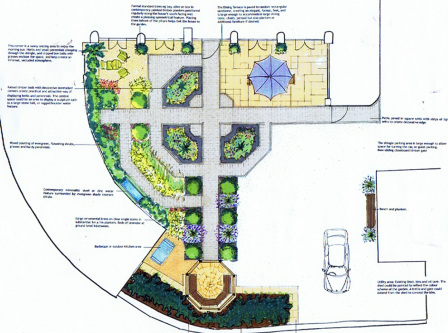 I based the design on a traditional layout with formal paths between beds, which gives the garden a strong structure. This is softened by the planting which is herbs, flowering hardy perennials in blue, white and purple, and grasses. The clipped evergreen trees create a mini avenue, underplanted with masses of lavender, and bay trees in contemporary planters line the front of the house. There are focal points within the site for putting sculpture, and a water trough nestles against the wall. This is the view from the far side of the garden looking back towards the house. a good place to create an evening chill out space. The pergola could be decorated with lanterns, the inbuilt seating made comfy with cushions and there is room for entertaing friends round a fire bowl or BBQ. The raised planting around it is retained by a cotswold stone wall with smooth coping for additional seating for guests. I designed these raised beds for growing herbs and flowering perennials, partly as a way to overcome the shallow, poor soil on the site, but also to create interesting shapes and paths to explore within the site. Amongst the herbs, plants like Stipa Gigantea and Verbena Bonariensis will form a delicate screen, while clipped evergreens provide structure all year round. Also allowing space for parking and turning the car was essential. Planting begins! Using standard trees gives the garden a head start. 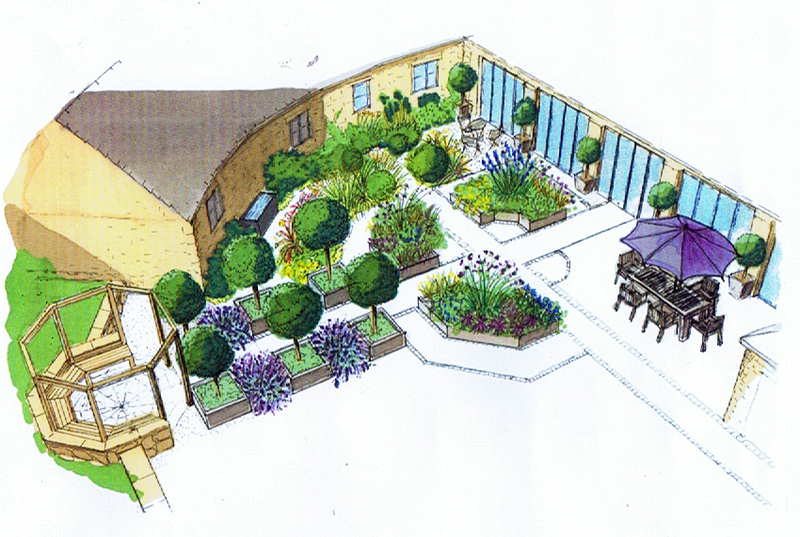 The scheme is based on lilacs, blues and whites, using a clipped box and lavender hedge to provide structure. The herbs will spill over the herb garden planters, softening the edges, and the large bed has drifts of the crimson knautia macedonia to provide a rich accent colour through the summer.